Inventory We are a resale marketplace, not a box office or venue. Ticket prices may exceed face value. This site is not owned by Moda Center . The Moda Center at the Rose Quarter in Portland, Oregon opened October 12, 1995 with a David Bowie concert. The Moda Center is home to the Portland Trailblazers of the National Basketball Association. The official seating capacity for basketball games is 20,630. The Moda Center box office is set up to handle many different events including ice hockey, lacrosse, basketball, center stage, and end stage shows. The Moda Center was built on a construction cost of $262 million and is currently owned by Paul Allen of Microsoft fame. Moda Center tickets in the past have included events like the NBA Finals, NBA All-Star Game, US Figure Skating Championships, NCAA Basketball Tournament, WWE, and many more concerts. 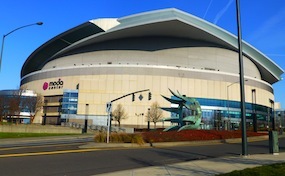 Moda Center is located on 1 Center Court in downtown Portland, Oregon. The Moda.CenterPortland.com is a privately held company that specializes in the sale of tickets in the secondary market. We are not affiliated with any official supplier or box office. To purchase tickets to any Moda Center in Portland events simply call our operators at anytime or click on the event you wish to attend.